When I was in cosmetology school I came across this product at a hair show. This was when flat ironing was big and the style was to have super flat silky hair. Well, we all know overly flat ironed hair is never silky… until this innovative product hit the market. It’s a pre-flat iron spray that is applied to dry hair then you flat iron right over it. I was told the hot flat iron will steam because the heat is infusing the product into the hair. When I heard this I was like “Yeah, sure.. okay…” but then I used it. It really does make my hair feel super silky, shiny and healthy. I am a stickler for healthy looking hair (who isn’t?). Of course I bought it, as well as the entire set of CHI round brushes (so worth it!). You can do a quick spray over your head or spray individual pieces for maximum heat protection while still keeping some volume. I do have thick-er hair but even on more fine hair you can use a lot and it doesn’t look greasy. If you are looking for a good thermal heat protecting spray this is my best suggestion. 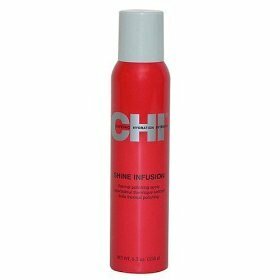 Compared to CHI Shine Infusion spray I think all others fall flat, literally. Oh, did I mention is smells like really good men’s cologne. I love it! (and my boyfriend likes the smell better than overly perfumed flowery stuff). You can find it at salons or websites like ebay and amazon.